Lacey Pinkerton is busy getting ready for spring at Pink's Flowers and at the same time Port Danby is bustling with activity as it prepares for its annual flea market in the town square. In the midst of it all, a talented group of artists has shown up with their easels to paint pictures of the Pickford Lighthouse. When one of the artists turns up missing and then dead, Lacey works alongside of her favorite detective, James Briggs, to solve the murder. What she doesn't expect is to end up on the murderer's short list of enemies. Lacey Pinkerton and the town of Port Danby are preparing for the annual Fourth of July celebration at Pickford Marina. Lacey's parents are coming to stay for the week. Lacey and her friends at the Port Danby Garden Club are excited to set up a fundraising booth at the festivities. But the patriotic celebration is cut short when one of the club members is found dead. While her trusted and handsome partner Detective Briggs is dealing with a personal issue, the unexpected return of his ex-wife, Lacey works hard to tamp down the disappointment and find the killer. Port Danby is in the middle of a scorching summer heat wave. Looking for relief from the sweltering temperatures, Lacey Pinkerton invites her newly minted boyfriend, Detective James Briggs, out for vintage movie night at the Mayfield Four Theater. It promises to be a fun evening filled with Humphrey Bogart, frosty lemon-lime drinks and, most of all, air-conditioning. But when the theater owner is found dead in his office, the classic movie date night turns into a murder investigation where the motives are plenty and the poison is suspiciously sweet. After a busy day providing bouquets and pumpkins for a ten year high school reunion at the posh Chesterton Regency Hotel, Lacey Pinkerton is thrilled to have a nice romantic dinner with her boyfriend, Detective James Briggs. But when the reunion's class bully is thrown from the hotel balcony, Briggs is called to duty. Lacey soon finds herself involved in a complicated murder investigation where the evidence points in every direction and the victim has more than his share of enemies. The new year is off to a smooth start. Pink's Flowers is doing well and Lacey is growing even closer to her wonderful boyfriend, Detective James Briggs. But when a local man is killed, one of Lacey's dearest friends is implicated in the murder. Briggs has asked her to step away from the case but Lacey is determined to find the real killer. Will her meddling cause irreparable damage to their relationship? Lacey must risk everything, including her heart, to find the truth. 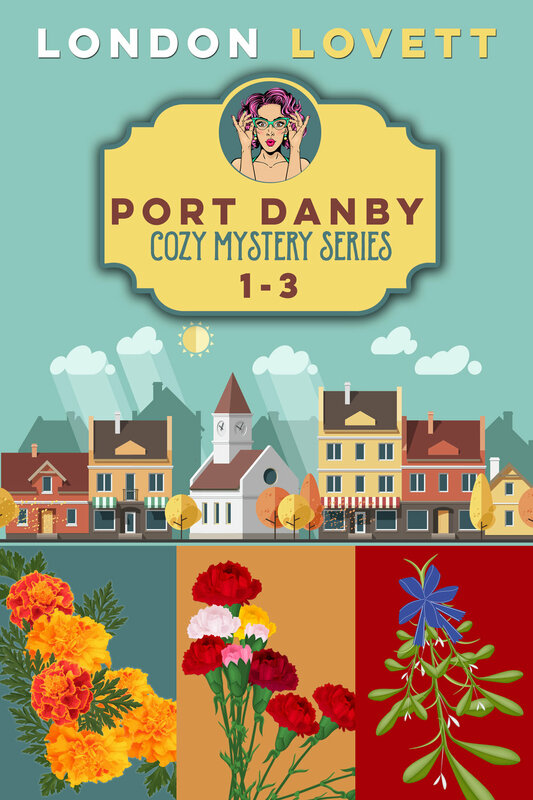 This volume contains the first three complete cozy mysteries in London Lovett's Port Danby Cozy Mystery series. Join Lacey 'Pink' Pinkerton and the cast of colorful, lovable Port Danby characters—including the endearing and handsome Detective James Briggs—for three intriguing murder mysteries.